We do the legwork, you do the holiday. Planning a family holiday can be a nightmare. Which restaurants will cook 'off the menu' to please small, fussy appetites? Which beaches have clean toilets and safe bathing? Does the campsite have a supervised toddlers pool? This is exactly the kind of specific information "Frommer's With Your Family" guides provide. 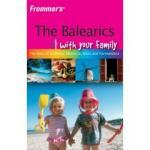 This book is packed with essential 'on the ground advice on planning a holiday to please every member of the family. Each listed destination, activity and accommodation has been visited and tested - and only truly family friendly entries are featured. This book includes key features such as: full colour throughout; dozens of the most family friendly hotels and restaurants carefully selected, visited and reviewed; full of Top Tips, Best Bets, history, anecdotes, Fun Facts, bizarre stories and much more; and, all the practical information you need to make the most of your holiday, together with lots of insider tips. It is written by UK authors for UK families.